If you find that you are having to input the same weight and dimensions for your shipments over and over again then it's time to create saved packages. The first thing you need to do is create a saved package. To do this hover over Settings and click Shipping. Then just scroll down the page to the Packages section and click ‘Create saved package’. 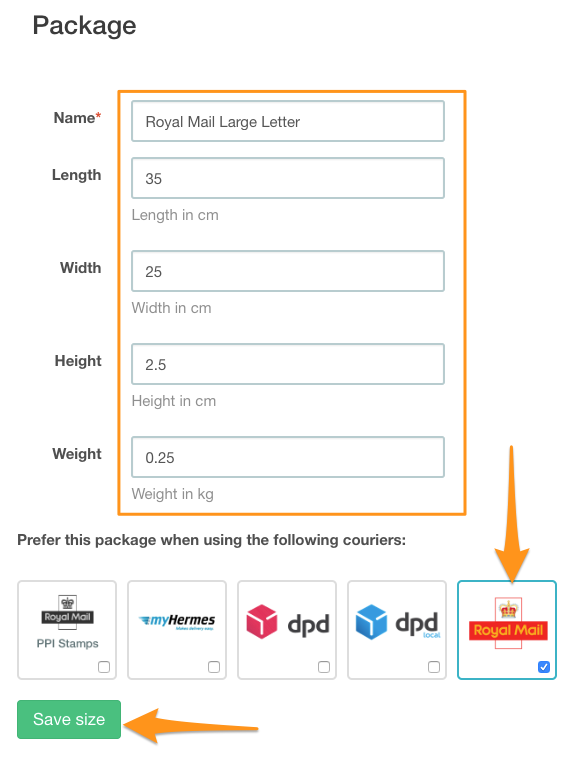 Start by giving your Package a name, "Royal Mail Large Letter" for example, then input the dimensions and weight. Optionally, you can then select the courier(s) you would like this Package to show as a favourite for when creating shipments. Now you can repeat this process for all the package sizes that are needed for your company. Just click the Create a package button again. Now that you have created a saved package it's time to use this to speed up your shipping. 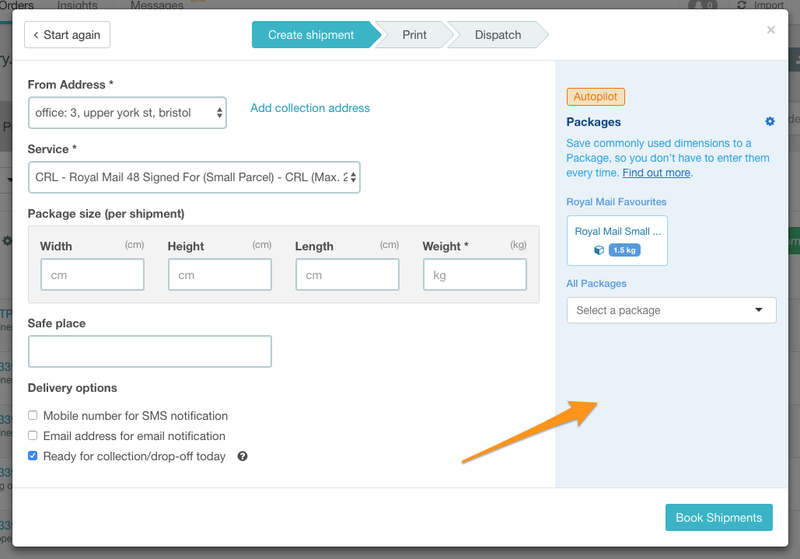 First, select the orders that you are going to ship then click the Create shipments button. 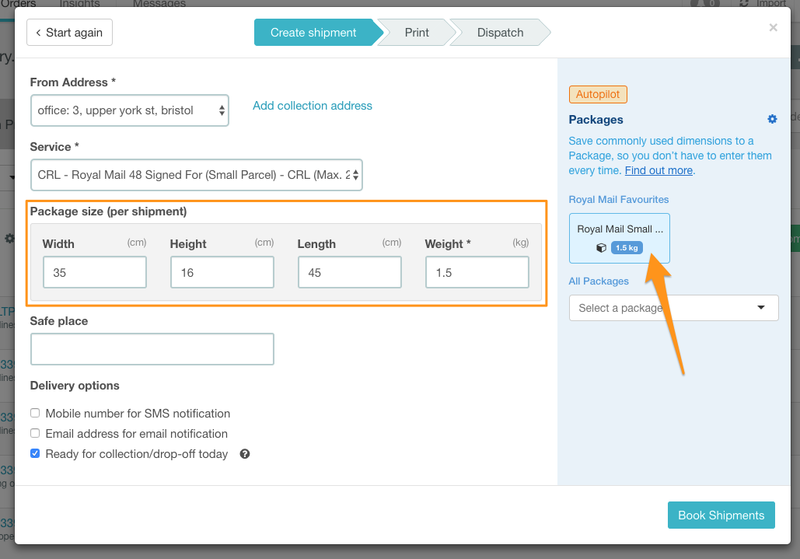 Now in the Create Shipment modal, you will see the new Packages displayed on the right-hand side. At the top, you will see your courier favourites (in this example they are for Royal Mail). In this section, we display up to 4 Packages per courier then with a single click the saved package will add the dimensions and weight. If you want to use another less used Package that isn't set as a favourite you can access all your Packages from the dropdown just below. Plus if you are a power user with a lot of saved packages, you can search for the right one in the drop-down.